This is a Sponsored post written by me on behalf of Arcsoft for SocialSpark. All opinions are 100% mine. 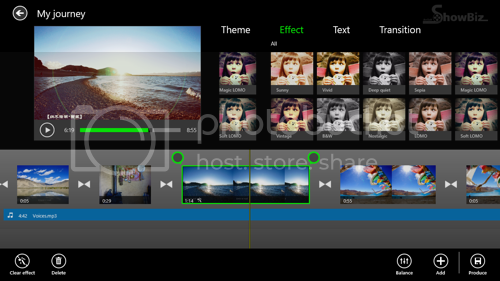 Showbiz is the movie maker app for Windows 8 developed by Arcsoft. I’ve just tried the app on my Windows 8 Asus laptop and the first impressions are good. Arcsoft Showbiz share some similar functionalities as the Windows Movie Maker but it is much easier to use as there are some more awesome features. The ShowBiz Windows 8 app could be downloaded for FREE on the Windows App Store now. You run the app, create a new project and you are ready to make your own movie. The app then asks you to add photos/videos to get started. Here is how the main screen looks like, so elegant and simple. I managed to create a short movie from my pictures in just 1 minute. It could even be faster if you have a Windows 8 device with touch screen. You can use all your creativity to add beautiful themes, text, effects and transitions to your video. I can imagine your happiness when your beautiful memories are shared with friends and family. Remember to add background music so that viewers can have the best experience. The app allows producing final movie to HD (resolution of 1280 x 720 pixels) and full HD (1920 x 1080) files, however you will have to upgrade to Pro version for the feature (the app price is $8.99). The free version only supports QVGA (320 x 180) and VGA (640 x 360) MP4 files. Overall, I think this app is suitable for everyone and this is absolutely a good choice when you need to make a movie in Windows 8. It will even better if Arcsoft considers adding more themes and effects.